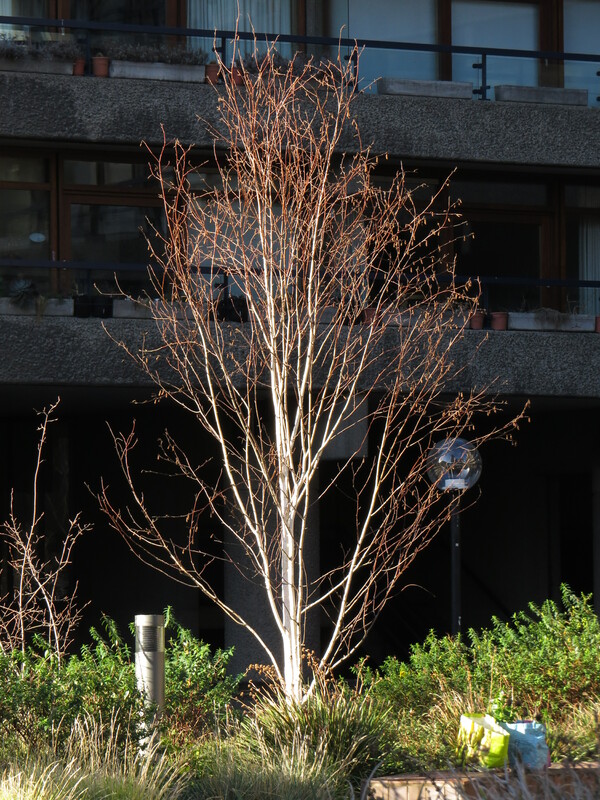 Dear Readers, you may remember that I visited the planting at the Barbican Centre in London a few years ago, and was very impressed. Today, in an attempt to get back to something like normality, I went to see a matinee of Macbeth featuring Christopher (Dr. Who) Eccleston in the Barbican Theatre but before I settled down I wanted to see how the gardens were standing up, and what they looked like in the most uninspiring month of the year. 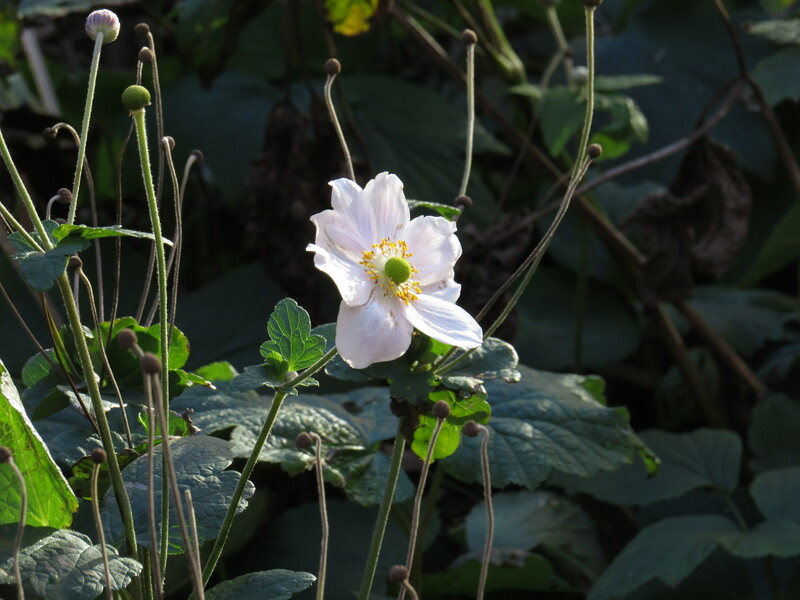 By January, most gardens are looking a bit tired, and one is lucky to have more than a few things in flower. It’s all about texture, and these plantings have that in spades. The light at this time of year can be strong but the sun is low in the sky, and this creates all kinds of strange effects between the tower blocks. It’s here that the grasses come into their own. The seed heads look molten, glowing with an unearthly fire. I felt as if my poor parched senses were drinking the beauty in. 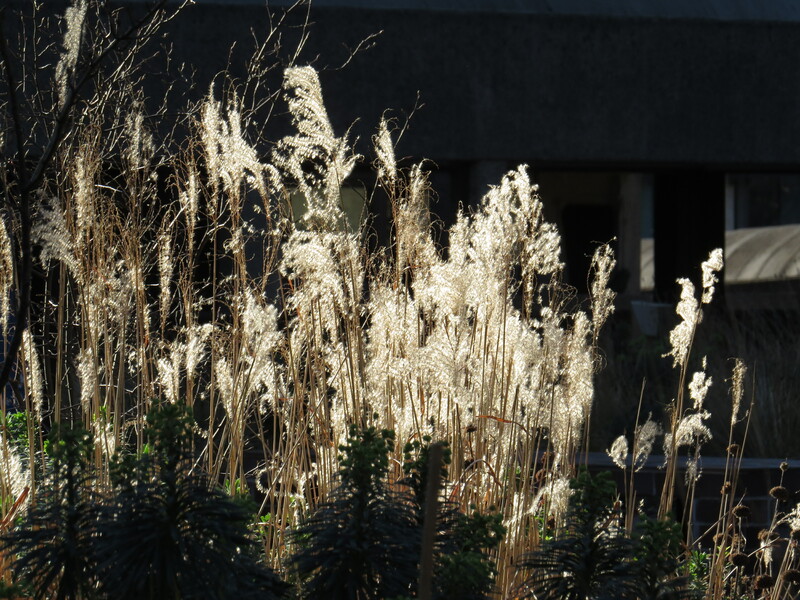 The icy wind whistles between the buildings, but there were hardy souls weeding and tidying the beds. I told one man how much I enjoyed the gardens at any time of year, and he pointed out a few things that were in flower, a salvia and a little cranesbill. But strangely enough, it’s the starker delights of bark and twig that appeal to me at the moment. 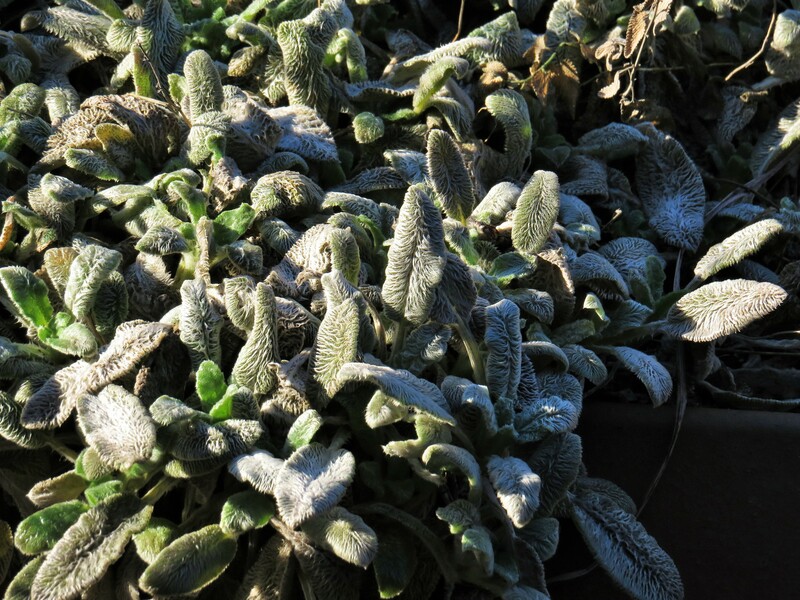 I found one spot, sheltered from the wind, where I noticed the fur on this frosty-leaved plant. I love the way that each leaf has a centre-parting, like a damp-haired schoolboy. 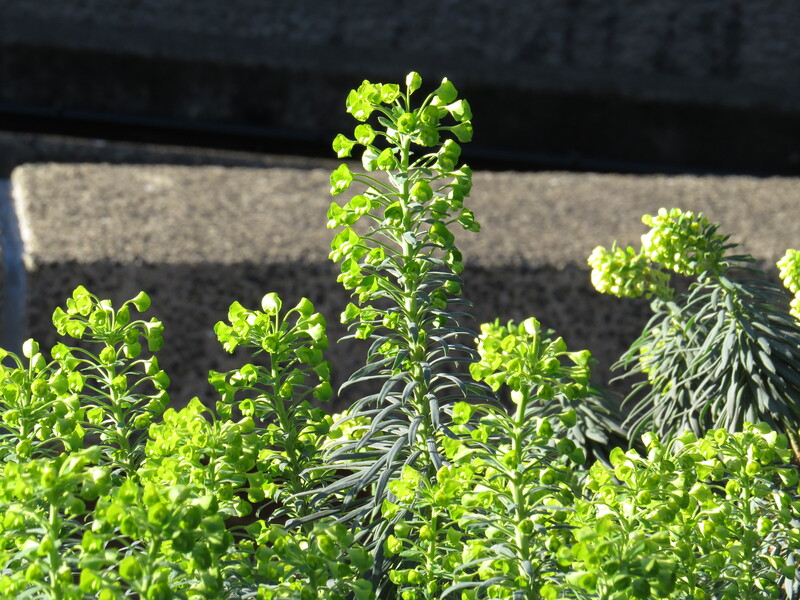 The euphorbia and the Japanese Anemones are still going strong where they have some protection from the cold. Because of the way that the sun reflects from the windows, there can be strange, fleeting puddles of light. 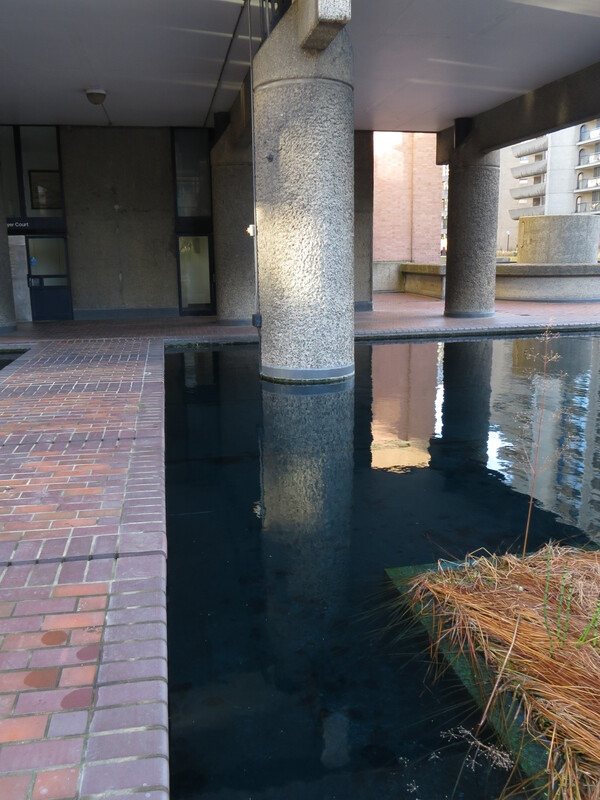 There is a pond under one of the buildings, and went to see if there was a yellow wagtail, as there had been on a previous visit. Today, there was nothing but reflections. There are some big, concrete containers that have been planted with a wildflower mix. 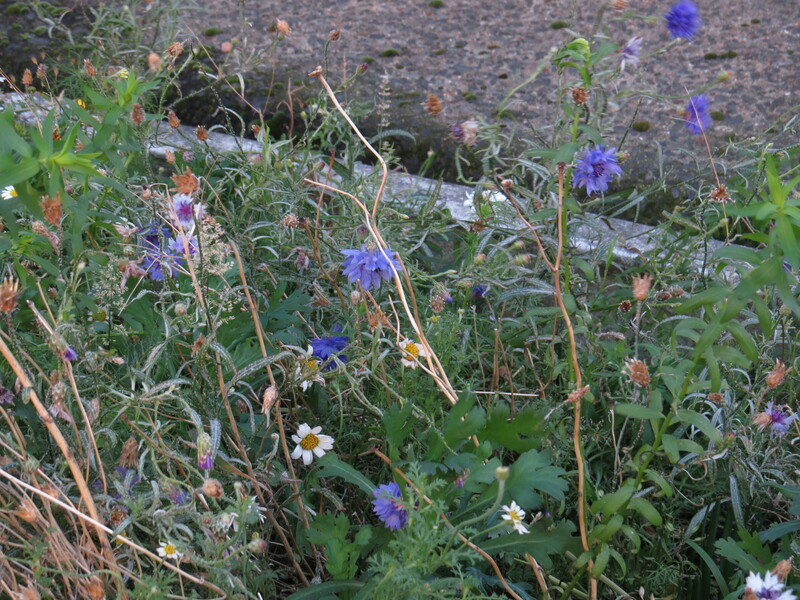 I was surprised to see cornflowers and mayweed and yarrow still in bloom. I have seen wildflower plantings in a number of other places, but have my doubts as to the provenance of the plants – near to my house in East Finchley, an area has giant yarrow and the largest-flowered creeping thistle that I’ve ever seen. Possibly these are cultivars, but they look remarkably like the wild plants on steroids. The plants here, though, look pretty much like the real thing. 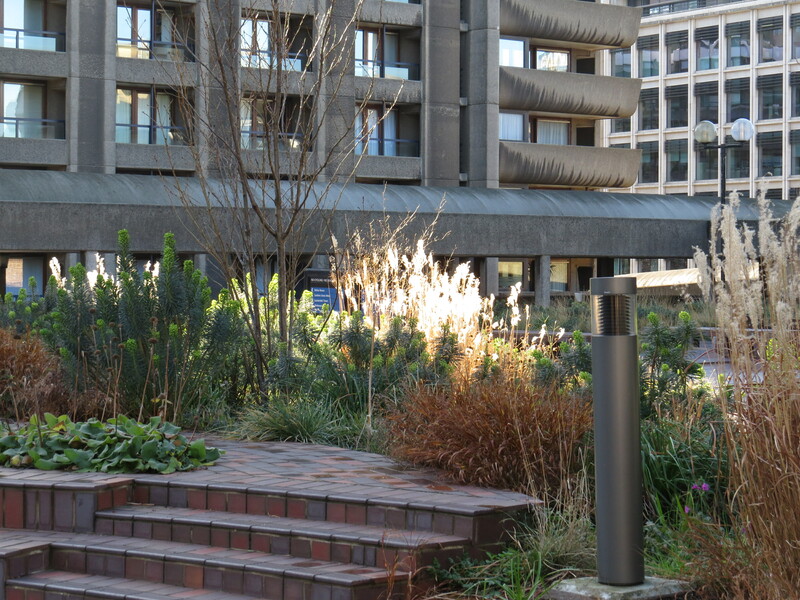 I used to visit the Barbican regularly at lunchtime (I worked just across the road), and it was a most unimpressive place, with the beds full of regimented primulas and well-behaved geraniums. Today it’s a wild and woolly prairie, full of interest even at this time of the year. When I visit in summer the place is full of pollinators having a pit-stop for nectar and pollen. This is an exposed and variable habitat, where the wind scours the soil and the sun blazes down, but the garden is doing well. It just goes to show what can be done with a bit of imagination. And Macbeth was pretty good too, with the part of the witches taken by three scary children in identical red dresses, and Christopher Eccleston giving it his all in a northern accent and body armour. I get a bit fed-up with the handbrake turns that the characters take, but I think we have to blame Mr Shakespeare for that rather than the performance. It sometimes feels like one of the few Shakespeare plays that could actually do with being a bit longer to allow for the deterioration in the characters’ states of mind. But still, if you fancy a couple of hours of supernatural goings on, the descent of one of the lead characters into madness and all manner of surprising goings-on, this is your play. 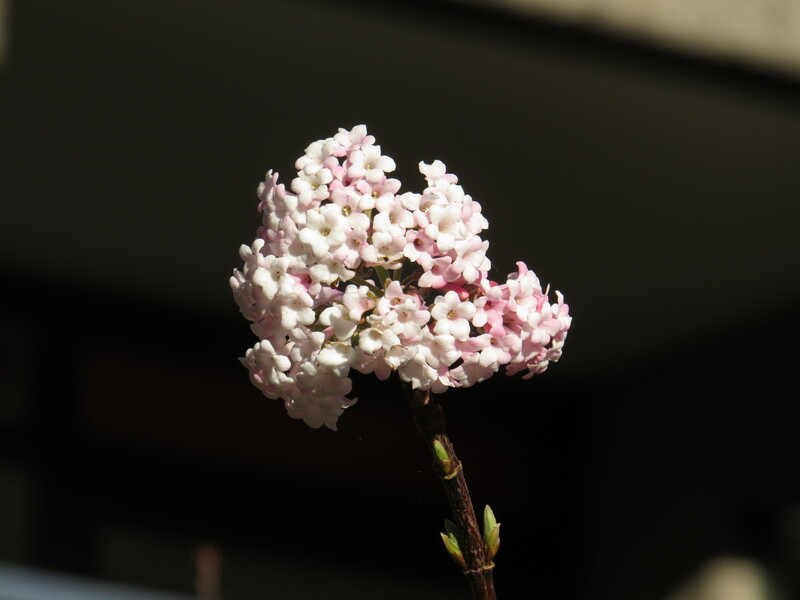 This entry was posted in Bugwoman on Location, London Places, London Plants on January 19, 2019 by Bug Woman. A particularly lovely one this week. Thank you for it. When teaching ‘Macbeth’ long, long ago I often felt that it wasn’t suitable for kids because of its strong whiff of sheer evil. Believing in hell and damnation meant that Shakespeare’s audiences really knew where M. was heading, as did he. No surprise that actors have such a collection of superstitions about the Scottish play. It is an extremely dark play, and I think that modern productions are a little too ironic and knowing. I preferred the much-slated National Theatre production of the play to this one, strangely enough: the NT production laid on the blood with a trowel, but it was somehow more coherent. For example, the ‘pleasant seat’ of Macbeth’s castle was actually very shoddy, and you could see why Lady Macbeth would want her husband to improve his situation. It emphasised how Macbeth felt hard done by following all his military successes at the beginning of the play. And, in a particularly horrible twist, Lady Macbeth bleeds to death after cutting off that ‘little hand’ (done off stage and rather more subtle than it sounds 🙂 ). It’s what I love about Shakespeare though – there is always something new for directors to play with. Sometimes it works, sometimes it doesn’t….. It looks more like the Lurie Garden in Chicago than a garden in London. It does not look very English. 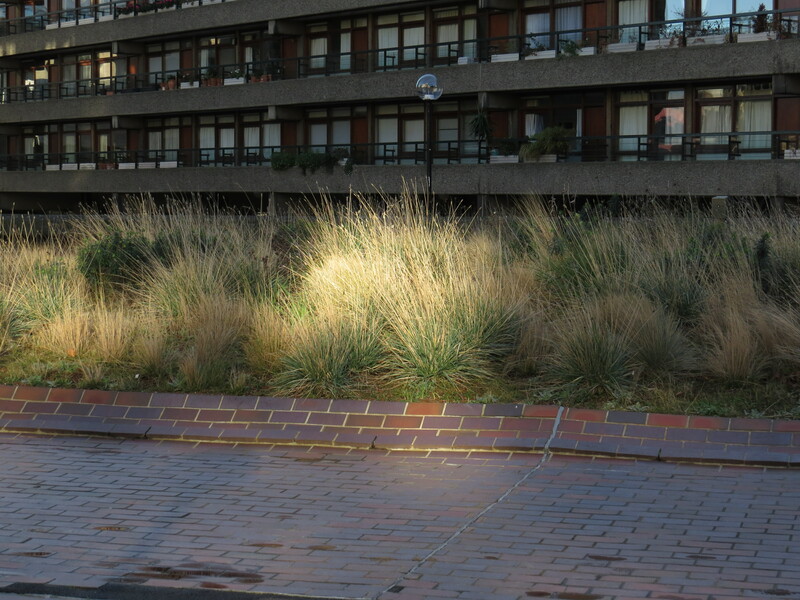 No, but we are seeing this style of planting more and more in the UK…. 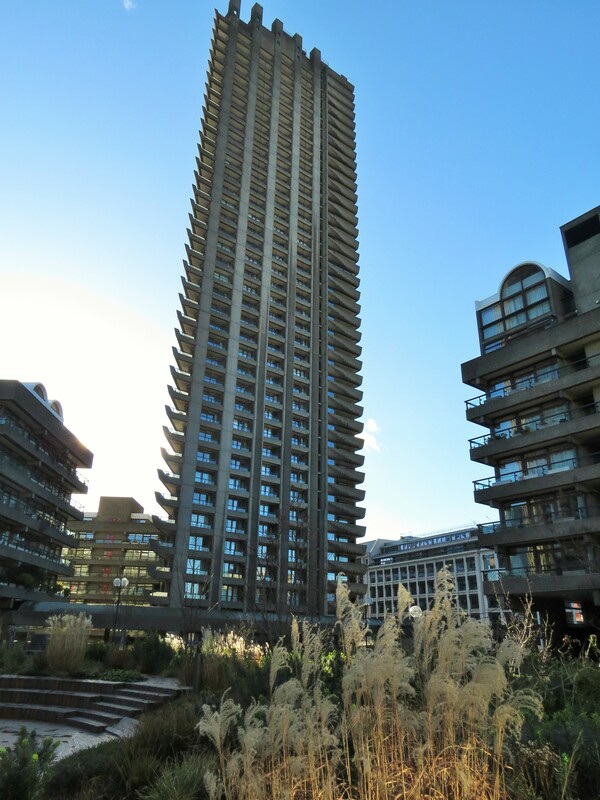 Love the Barbican and as you say the prairie style planting these days is so much better against all the brick and concrete than the parks styles of yesteryear! Yes, I really love it – that Piet Oudolf style seems to be all the rage everywhere. If only I could get it to work in my garden, it’s a lot more work than it looks…. Yes you are right prairie planting is quite a tricky look to pull off and get established…worth it though!